Paperback, with flaps, 224 pages, 13.5 x 20.6 cm, 5.3 x 8.1 in. "What you will find here is sometimes as absurd as a stage play by Václav Havel. Or as complicated as a story by Franz Kafka. You think I'm exaggerating? Well, I haven't even begun. And anyway: the stories might not all be even one hundred percent true; but then we shouldn't have met in the pub if you wanted to hear the absolute truth." Martin Becker collects biographies and stories of Czech writers and has combined them in his essay to create a study of the literary soul of the country. These are stories of arriving and parting; of remaining although staying is no longer bearable; of going although one would prefer to stay; of improbable encounters and humour, charm and melancholy. Becker's book invites us to see Czechia from a different point of view and lose oneself in the country's wilful literature. 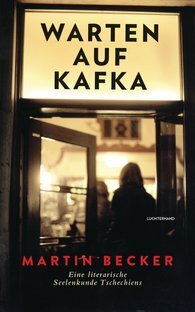 "Clarity and succinctness, wit and irony – scarcely any other contemporary German author strikes this rhetorical four-note chord as powerfully as Martin Becker."